I honestly cannot believe it's been a full year since I started my blog! I remember when I first started planning my blog I was excited, scared, and nervous and now I can't imagine not having it. I've met so many amazing people through my blog, friends who I would have never met if I hadn't started this journey and blog friends who have become in real life friends that I cherish every day. There are so many days that I wish all of us lived in the same city so we could all meet up for drinks or brunch but I'll take getting to talk to you all through e-mail happily! Unfortunately I was a bad blogger and had planned on doing a big giveaway for my one year anniversary but life got in the way and it snuck up on me quicker than I planned. For those who have been following my blog for awhile you know the past month has been a bit chaotic for me and hopefully things will start to settle down for me soon and I can get back into the swing of a normal life. Since I failed to do a fun giveaway I just really wanted to thank you guys for supporting me, for reading my blog and commenting, for helping me smile when I'm feeling down, and for becoming the great friends you guys have become! I appreciate you all so much, without you guys I probably would have wanted to give up blogging more than once! Ok, so enough with the sappy stuff before I cry! 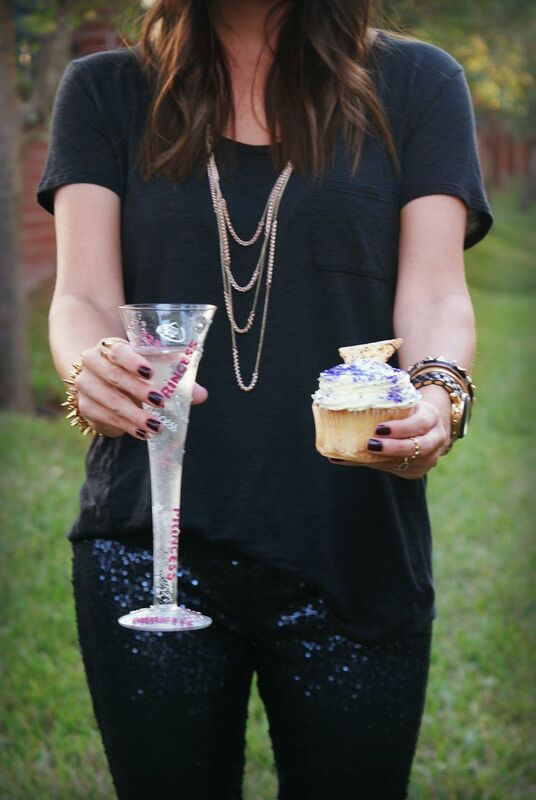 Since my blog IS called Sequins & Sea Breezes I thought it was fitting that I rock the sequins on my one year blogiversary! I've been obsessed with sequin leggings for awhile so I was super excited when I found these. I really wanted to keep it simple and classic so I went with the all black look with a bold lip. Happy Blogiversary! Those leggings are so cute! So is that last picture of you! Adorable! Congrats on your one year!! That is so exciting :) Your photos are gorgeous btw. Cheers to your blogiversary! And of course, you are totally rocking those sequin leggings - love them!!! Congrats on one year that's big time!!! I'm about four months in and I was so scared to start too:) those pants are incredible I can't believe they are from American eagle! You look amazing in these sequined pants- stunner, stunner! Happy, happy Blogiversary, sweet friend! I love that outfit, you are rocking those pants, ow ow! YAY GLITTER! YAY CHAMPS! YAY CUPCAKES! Aaaaaahhhh! THOSE PANTS! I decided after reading your post last week that I wanted to find a black pair of sequin leggings, these are so perfect! You are rocking this outfit! Happy 1 year of blogging!! p.s. Still thinking of you and hoping everything settles quickly!! Yay!! Happy blogiversary!!! Can you believe it's already been a year?! Loving those pants!!! way too cute!! Aww, yay! Congratulations!! I totally understand life getting the way...we were moving for my 1 year blogiversary, and I completely missed it, oops. 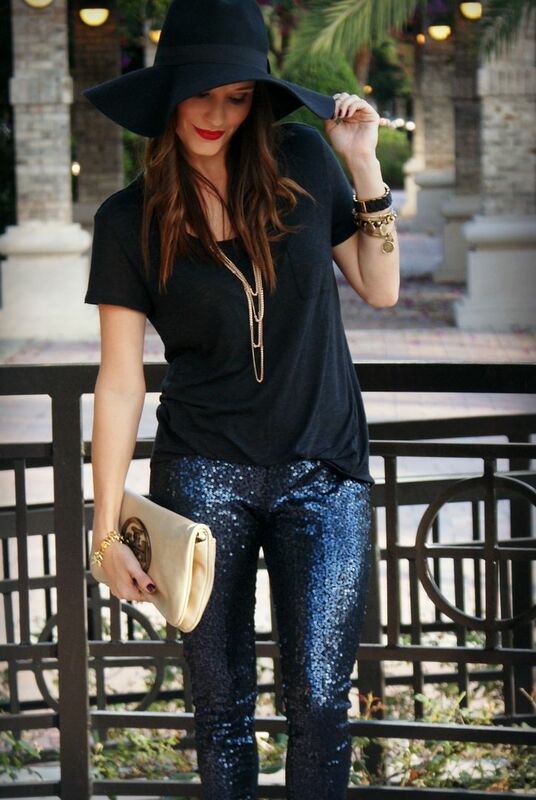 Love the sequin leggings!! Happy blogiversary!!! Love the outfit so much!! Would be perfect for NYE!!! Happy one year! Those sequined pants are so cute, you look stunning! Happy Blogiversary! 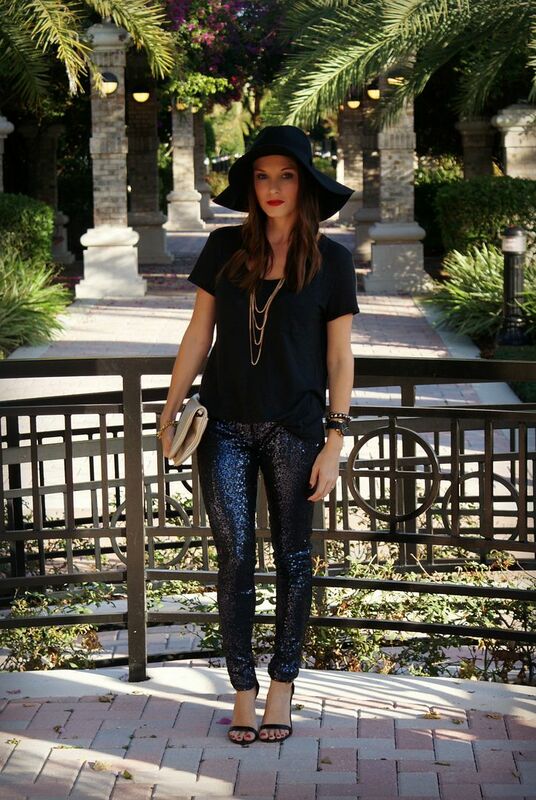 These sequin leggings would be perfect for NYE!! Happy 1 great doll! Those sequin pants are too cute and that last picture is perfection. Happy Blogiversary, Pamela! I'm so glad that we've connected with each other through this little community - maybe I'll make it to Florida one of these days (or you back up North! ), and we finally can go get some cocktails. 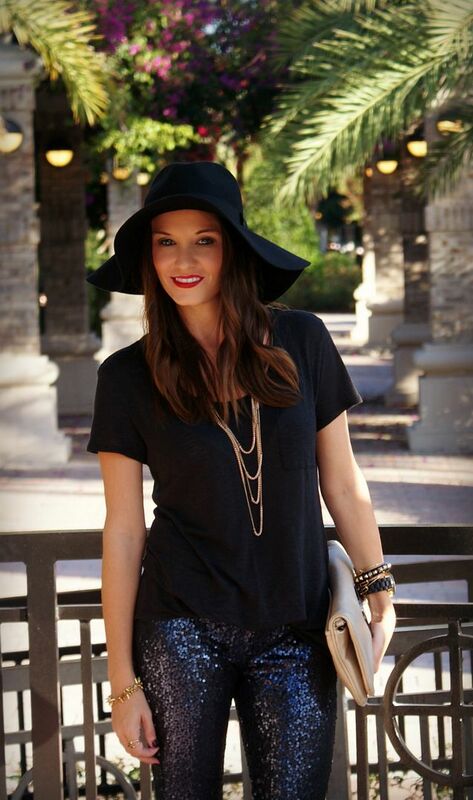 :) Your outfit is perfect for this post - you know I love those sequin leggings! YAY for one year!! And how fabulous are those sequin pants?!? Love!! Happy one year blogiversary Pam!!! Congrats on 1 year pretty lady! You are rockin' those sequin legigngs! Happy blogiversay!! 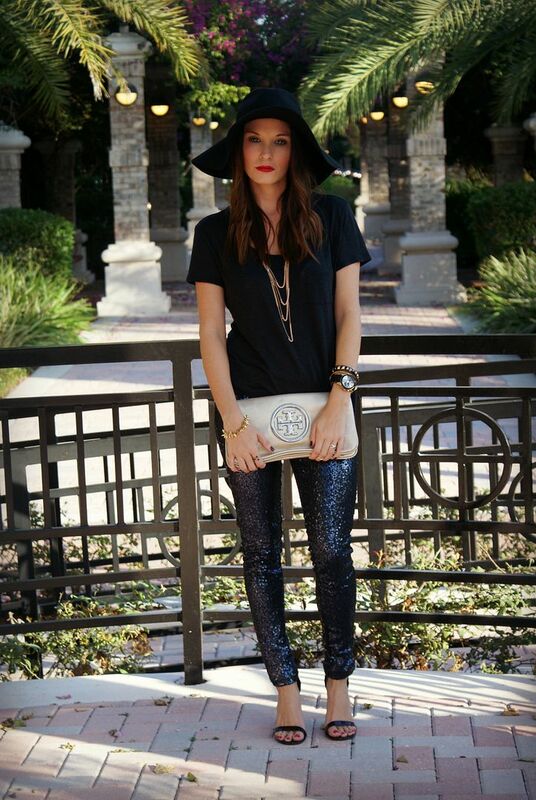 You look ah-mazing in those sequin leggings (I want a pair so bad)! Can't wait to see what's in store for Sequins & Sea Breezes in the next year...keep up the good work! Congrats! Love these pictures! I can't wait to share mine for 2 years. So glad you blog and love coming here every day! And I need those leggings, ASAP! Happy blogaversary! How exciting is that?! You look absolutely stunning, as always! Happy blogaversary!!! I looooooveee those sequin leggings, they look fab on you! And I love your blog, of course. :) Happy I found it! Happy blogiversary! 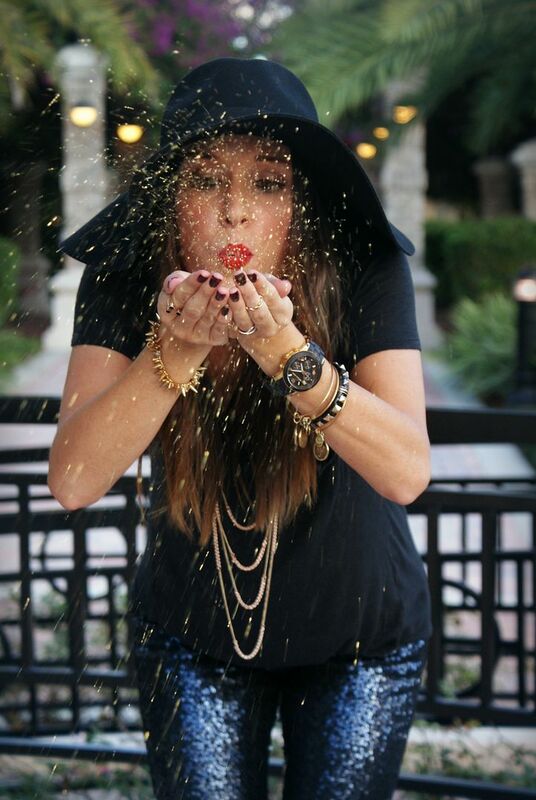 Your pictures are to cutest and LOVE your outfit, I need some sequin pants :) Love you & your blog, so glad to have become friends with you through our blogs! LOVE those sparkly pants! Going to check then out now! And that SD spiky bracelet caught my eye immediately!! I'm so impressed you got that glitter picture! You were probably like alright we got one shot we better get this right! ;-) I am obsessed with those leggings!!!! I'm so glad we have met through blogging!!!! Now we just need to live in the same city so we can drink lots of wine and take fashion pictures all day long! Congratulations hunny! Happy one year, love! You are KILLING it in those pant! Happy Blogiversary girl!! Love the sequins on you! You look so so so fabulous! These may be my favorite pictures of you ever :) I have loved getting to know you and share this blogging journey together! Happy Blogiversary!!!!! Love your blog, so happy to read it everyday. Love those pants, and the glitter picture, you're a beauty! Congrats!!! Such an accomplishment!! 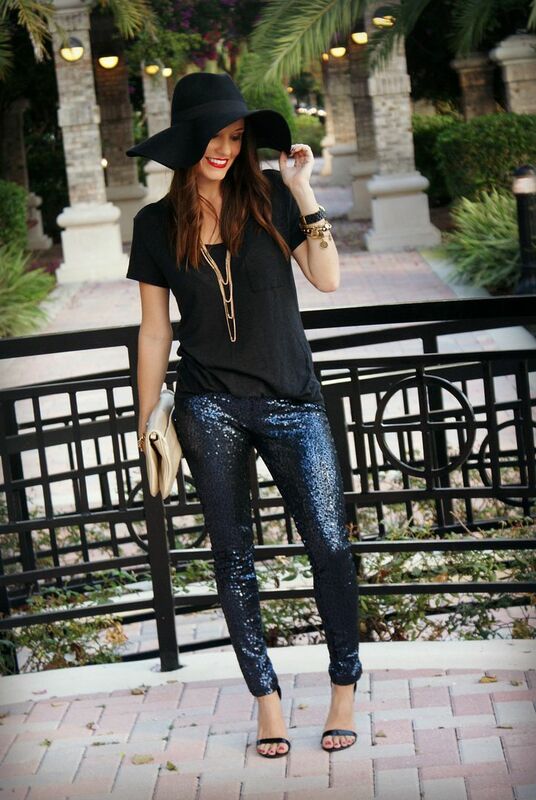 Loving these sequin pants...this is the perfect New Year's Eve ensemble!! LOVE thar last pic!! Happy Happy blogiversary!! It is such an amazing accomplishment and I really love reading your blog every day :) and not to mention, those sequin pants are beyond amazing! i cannot believe those pants are from aerie. fabulous. this look would be perfect for NYE.. I couldn't pull it off any other time of year. anywho, congrats on your one year, i love your blog of course!!! What a fun outfit.. I love the leggings!! Happy Anniversary!! Love love your outfit!! Wishing you much happiness always. Happy blogiversary! Love hitting that one year mark. And you look gorgeous in those pants, dang girl! That last picture is so pretty with the confetti! I love the sequins leggings! I like that they aren't completely skin tight either! :) Happy Blogiversary! What a fun look! And happy blogiversary!! I love that last picture too! Thanks for joining the Celebrate Southern Linkup! I am pinning this terrific post to our official pin board! Cheers!